Physicists are using a technique reminiscent of a classic video game to observe DNA on the nanoscale. 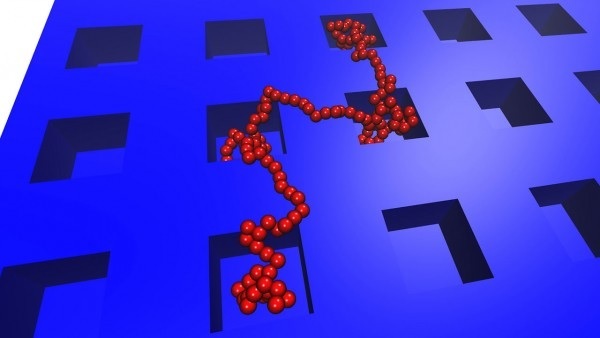 They call it “single-molecule Tetris.” The approach consists of a device filled with tiny channels and cavities that DNA molecules can move in and out of, resulting in some of the familiar Tetris shapes, like the “L,” the square, and the zigzag (illustrated above: a DNA molecule, in red, occupies four cavities in a zigzag). As the chainlike molecules bend or jump into different shapes, researchers use that information to measure two very specific characteristics of DNA molecules—the width and the confined free energy, or entropy of the molecule. Here, entropy relates to how many ways the energy of the molecule can be arranged. Physically, it correlates to the different shapes the molecule can take while maintaining the same distance between its two ends. Scientists collected data, published this month in Macromolecules, on these parameters to show the precise conditions under which DNA can be trapped in the cavities. It’s a feat that’s extremely difficult to do on such a minute scale, but thanks to single-molecule Tetris, these physicists now have results that could help biologists improve genome sequencing and tease out valuable genetic information from these tiny, confined bits of DNA.